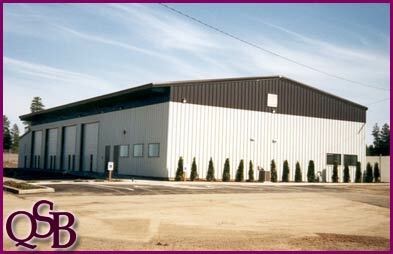 We have constructed many turn-key commercial projects for our customers over the past 13 years. If you are interested in a new commercial project, please contact our office and speak with our commercial design staff. We can develop a cost effective project design and formulate a quote for construction today! As a general contractor we can handle all aspects of your project from the site prep to the plumbing and landscaping. Projects we have constructed range from pole buildings to conventional stick or wood framed construction, concrete tilt-up and all steel construction for the larger clear-span projects. Some of our customers we have constructed projects for are: Napa Auto parts, Coulee Dam Credit Union, Bel-air Composites Manufacturing & Offices, Blimpies Restaurant, Svedala Paint Booth, Spokane County Geiger Maintenance Shop & Offices, Silver Eagle Bus Garage & Offices, over 35 buildings for the Washington State D.O.T. and many others. Some of these were post frame construction, wood framed or all steel construction. We build what you want and it’s cost effective.